William E. Patterson age 86, of Ashland, died Wednesday May 9, 2012 at Brethren Care Wasen Rehab Center. He was born on December 9, 1925 in Ashland, the son of Wayne and Myrtle (Welty) Grindle. Mr. Patterson had lived all of his life in Ashland and had worked for Fisher Printing Co. in Galion. 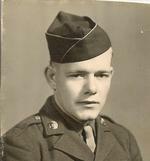 Mr. Patterson was a veteran of the U.S. Army, he served in WWII. He was a member of the 1st United Methodist Church, and the American Legion Post #88. He enjoyed helping others in need, was an avid reader, had exceptional work ethics and dearly loved his wife Bernice of 65 years. On December 8, 1946 William married Bernice (Powell) Patterson who survives. Other survivors include his two daughters and sons in-law, Pamela and Mark Pape of Ashland, Sue and Jack Coffman of Castalia, Ohio; his two sons and daughters in-law, Bill and Pat Patterson of Ashland, Jeff and Nancy Patterson of Lakewood, Ohio; his grandchildren, Jon Serpa, Nick and Nicole Serpa, Caroline Pape, Todd Patterson and Fiancée Jacquie Trevis, Libby Patterson, Chad Seeholzer, Tracy and Chris Shilliday, Tally and Ben Swinehart, Tieraney and Kirk Hiner, Dave and Sarah Coffman, Tim and Jenny Coffman, Scott and Lisa Coffman; his 13 great grandchildren; along with his brothers and sister in-law, Gilman and Florence Patterson and Richard Patterson. William was preceded in death by his parents and three brothers, Robert Patterson, Thoman Patterson and Duff Patterson. There will be a private family funeral service with Pastor Kim Anderson officiating and military honors presented by the Ashland Veteran Honor Guard. The family suggests memorial contributions may be made to the 1st United Methodist Church Building Fund 220 Sandusky St. Ashland, Ohio 44805.